Every month I make a Video Kit Club video featuring Sparkle N Sprinkle supplies and a technique. 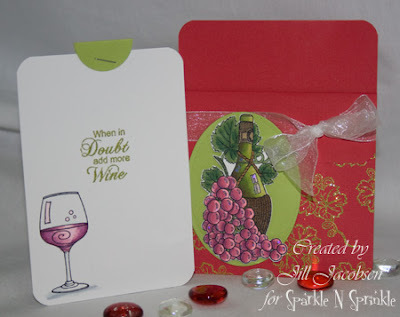 You get enough supplies to create 5 of the card....that includes the cardstock cut and scored, stamps, any embossing powders and/or glitters. This month I used our new wine stampette set Chianti. I am really having a lot of fun coloring these images and adding the sparkle. Love the pocket card for the Video kit this month Jill. I'm sure you'll get new takers with this one.